The workforce is becoming more diverse, there is still more work to be done. As companies become more globalized, the importance of diversity in the workplace has increased. Throughout history, there have been consistent barriers for people of color in the workplace. Being a minority in a predominantly white workplace can be considered stressful for many. Appearance and linguistics differ in every community, yet certain language patterns and physical attributes are viewed as more professional than others. 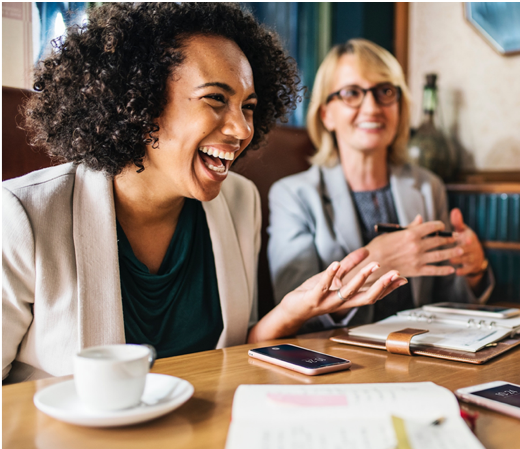 The workforce is undoubtedly becoming more diverse, and office culture has changed quite a bit over the years; yet there is still more work to be done. There are countless examples of Black professionals experiencing negative bias due to physical appearance. Many of these challenges are propagated by examples portrayed in the media. For instance, performing an online search for “professional hairstyles for work” typically yields results of straight, sleek hair; yet if you try a search for “unprofessional hairstyles for work” an overwhelming amount of results return with images of minorities with natural, curly hair. This generalization of certain styles being more work-appropriate has caused countless Black professionals’ strife when representing themselves in the world of business. For example, there is added pressure to consider hairstyles for an interview when trying to make a good first impression. Many people of color feel the need to straighten or alter their hair to improve their perception at work, avoiding common Black hairstyles such as afros, dreadlocks, and braids. Some of these efforts are even mandatory based on certain dress code regulations. Even the United States Army previously did not allow Black women to wear their natural hair on the job until an update to Army Regulation 670-1 in 2017. Other sorts of stereotypes have caused similar challenges for people of color aside from just hairstyle- including clothing selection, visible tattoos, and beyond. While many dress codes have recently been revamped to factor in cultural considerations (such as the aforementioned Army regulation adjustment), it is important for allies to pay special attention to any subconscious biases they may have toward minority colleagues, and to speak up in situations where others are showing bias due to a minority coworker’s appearance. In addition, interracial and intercultural communication in the workplace has slightly changed overtime. Being a person of color in a predominantly white workplace makes communication with others slightly difficult and at times stressful for Black professionals. Many Black professionals report that they speak ‘different versions of English’- one at home and another at work. This phenomenon is usually referred to as “code switching”. Usage of certain slang verbiage, that tends to originate within black culture has in the past, been considered as unprofessional. Today however, depending on the industry, many use slang terms within their day to day conversations amongst other employees. Communication within meetings can also be difficult, especially for Black female professionals. The Center for Women Policy Studies concluded that out of the women of color surveyed, 21% did not feel they were free to be “themselves at work”. The same study discovered that over a third of Black women believed they must “play down” their ethnicity to be successful. Research also shows that most women of color feel that they are not heard when speaking up during meetings or in the workplace and that their ideas are quickly dismissed, while Black men are often accused of being aggressive when trying to self-advocate at work. Overall, the barriers around interracial communication have improved however are still existent for many. 2. Be aware of your own subconscious biases towards certain types of language. A person may use certain slang terms or phrasing because these terms were common within their cultural upbringing, and not necessarily as a lack of professionalism. Additionally, try not to mimic language from another culture as a means of trying to appear more accepting or trying to fit in. Be true to yourself and your own linguistic patterns, and allow others the freedom to do the same. 3. Spend time to invest in learning about other cultures. Researching other cultures can help one understand how to respond to cultural differences. Furthermore, when you do not know the answer or you’re curious about someone’s culture- don’t be afraid to ask a colleague or wait to respond until gathering more information. At Capgemini, the A³ employee resource group (ERG) is working in collaboration with the Leaning in Together (L.I.T.) program to provide support for minority colleagues. Each month, a recorded interview and article are published on a topic chosen to further awareness and inclusion within the Black community at the company. Additional opportunities for these types of discussions are available through hosted events, mentorship, and an online communication platform open to both people of color and allies. These types of programs are imperative towards advancing the acceptance of diversity within the workplace. In conclusion, the workplace is becoming more accepting of diversity, but there is still room for improvement and cultural acceptance. Being more aware of language patterns, having more respect of personal space, being thoughtful and considerate of how comments may be perceived, can all be impactful and helpful ways to build bridges and foster productive relationships with your diverse counterparts. The A3 ERG exists to further the development of diversity & inclusion within Capgemini, as well as promote Capgemini’s core values, with emphasis on the African American community. A³ is focused on networking, mentoring, awareness, recruitment, and retention among those who are interested in African American culture.